Shown is what remains of a trailer that burned in the early hours of Friday morning last week on Shaw Baker Road. The fire claimed the life a man who the county coroner suspects was smoking cigarettes while using oxygen. HIGHLAND CO. — Fire claimed the life of a 59-year-old man in the Winchester area last week, and the county coroner suspects the man was smoking while using oxygen. Highland County Coroner Dr. Jeff Beery told The Times-Gazette that Roger Rhoads, 59, Winchester, died in a trailer that burned on Shaw Baker Road at around 1:30 a.m. Friday, Oct. 26. Beery said he suspects that Rhoads was smoking a cigarette while using oxygen and one of the two tanks in the house exploded. “He was known to smoke while using oxygen,” Beery said. According to Beery, Rhoads’ son, who was in another trailer nearby, was watching TV when he heard crackling outside and saw smoke. 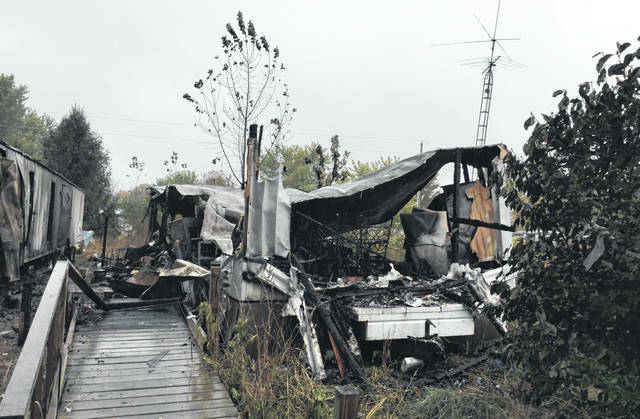 “The fire department responded promptly, but trailers burn so fast,” Beery said. Beery said the home was completely destroyed and Rhoads’ remains were found on a piece of furniture in the trailer. According to Beery, the state fire marshal’s office is investigating the incident. He said he has not found anything suspicious about Rhoads’ death.